"We're nothing but questions right now. Until you have played for a while you don't have any answers. Ask me in December and I'll tell you." 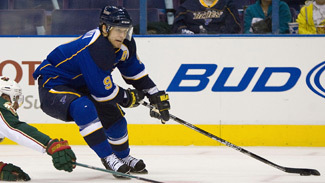 STOCKHOLM -- Will the St. Louis Blues continue to rise? Will their young players continue to grow? Will they be able to play with that same tough-as-nails, take-no-prisoners attitude that helped them jump from 15th in the Western Conference in February to sixth by the end of the season? Are they as dangerous as Detroit coach Mike Babcock consistently says they are? "We won't know all that until Christmas time," Blues coach Andy Murray said here this week as his team prepares for Friday's season opener against the Red Wings in the 2009 Compuware NHL Premiere-Stockholm. "These types of games (exhibition) make it tough to tell, but we feel good about our team," Murray said. "We have a lot of returning guys and we have Paul (Kariya) back and Erik Johnson back. I think we have helped solidify our goaltending situation with (Ty) Conklin. We have had a good preseason. The guys have worked really hard and we have had a lot of energy." Murray, though, quickly noted that the Blues' success in the preseason -- they won their last three games by a combined 15-1 score and overall went 5-1-1 -- simply means they did well in dress rehearsal. Even in showbiz that counts for nothing. "It doesn't count in the standings and there is nothing to show for it, but everybody's goal going into preseason is you want to feel good about your team, where you're at, your systems, timing and everything like that," goalie Chris Mason told NHL.com. "We have really followed the system well and we stuck to our game plan. I think the way you feel about your team means something and we feel pretty good right now." The Blues hope to keep that good feeling when they leave here Sunday, but to do so sniper Brad Boyes said they have to remember what they became last season. Ravaged by season-ending injuries to Kariya (multiple hip surgeries), Johnson (knee surgery) and Eric Brewer (back), as well as lengthy stays on the IR for Andy McDonald (broken leg) and T.J. Oshie (high ankle sprain), the Blues turned into a blue-collar team that simply outworked the opposition. They climbed nine spots in the standings from Feb. 12-March 12 and closed the season 9-1-1 to clinch the sixth seed in the West. They were swept out of the first round of the Stanley Cup Playoffs by Vancouver, mainly because they were so gassed. "The extra skill guys (Kariya, Johnson) are going to help out as far as the offense and giving us all a little more freedom out there, but you have to be tough to play against no matter what style you play and that's good for us because the guys we have coming back in the lineup are those types of players," Boyes told NHL.com. "We think they're going to complement us well and help the team win." "We reminded Paul and Erik that we won without them, so we're not going to change what we do," said Murray. Murray, though, said the Blues were that type of grind-it-out team even before they started winning last season. Nobody realized it because the results weren't there, but what they were doing was laying the foundation for their second-half run. "We didn't get a lot of points in the first half, but boy we played hard and because we played that way we were rewarded in the second half," Murray said. "If we had gone through the motions in the first half we wouldn't have been ready for it in the second." The fans in the St. Louis area certainly have noticed. From 2005-07, the Blues sold out only four games, three of which were Brett Hull Night, Al MacInnis Night and Free Food Night. Murray, who took over the team in December 2006, remembers his first home game they played the Chicago Blackhawks, "an arch rival and it was in front of friends and family only," the coach said. They sold out 31 games last season, including two in the playoffs, and Blues President John Davidson told NHL.com the team has sold almost 11,000 season tickets for this season, up from 6,600 when he arrived with owner Dave Checketts in the summer of 2006. "They trust us," Davidson said of the fans. "We had to reconnect with the fans in St. Louis because of circumstances in the past and we told them when we were 30th that we wouldn't be outworked. Andy did a great job of coaching our guys to play to win every night no matter what happened. They have been patient with us -- real patient with us." The fans were rewarded with some playoff games last season, but this season they are expecting more than just the two home games. The Blues are eager and confident to give it to them, but first they have to answer all of those questions. "We're nothing but questions right now," Murray said. "Until you have played for a while you don't have any answers. Ask me in December and I'll tell you."